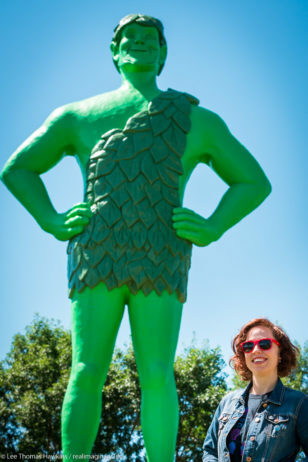 Becky poses with the Jolly Green Giant. Unbeknownst to us, this festival was happening as we visited! We just thought it would be a good place to have a picnic lunch—and it was. Becky mixed a couple cans of tuna with an avocado, which she ate with blue corn chips and I ate as an open-faced sandwich on a gluten-free bun. When we finished eating and photographing the statue, Becky started hunting for her sunscreen…which we neglected to pack. I also needed a restroom badly, so Walmart across the street became the most obvious solution to both problems. When we walked in, we realized that this was the smallest Walmart we’d ever seen. But that was OK, since it had sunscreen for Becky and a sparkling-clean restroom for me. We got back on I-90 just after noon. 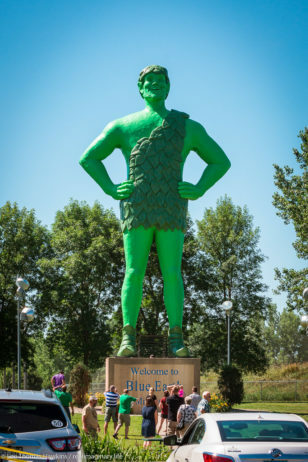 A 60-foot tall statue of the Jolly Green Giant was erected just off I-90 in 1978 to celebrate the Green Giant company’s history in Blue Earth, Minnesota. 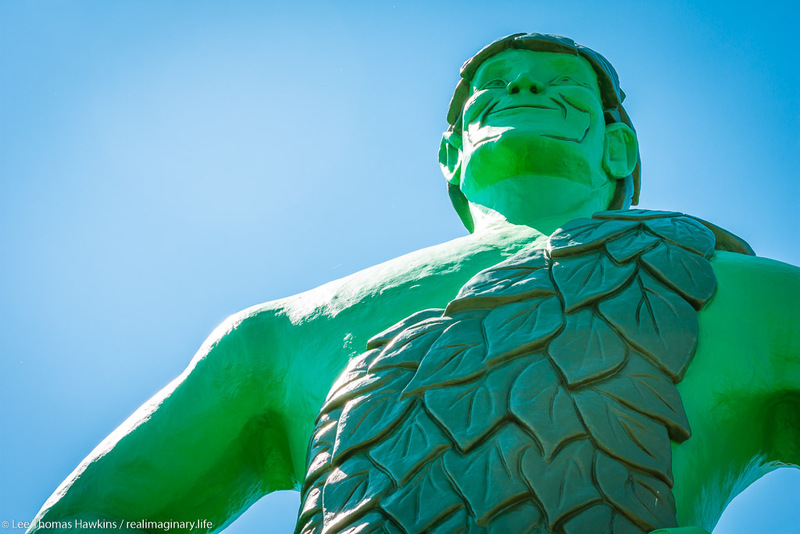 The “Giant Days” festival is held at the nearby fairgrounds here each July. 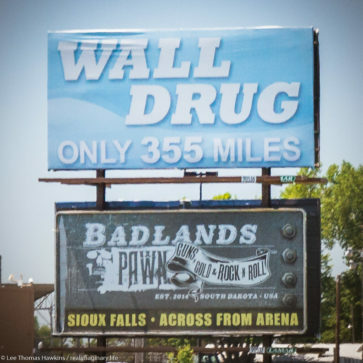 Billboards in Minnesota—over 300 miles away—advertise Wall Drug in Western South Dakota. 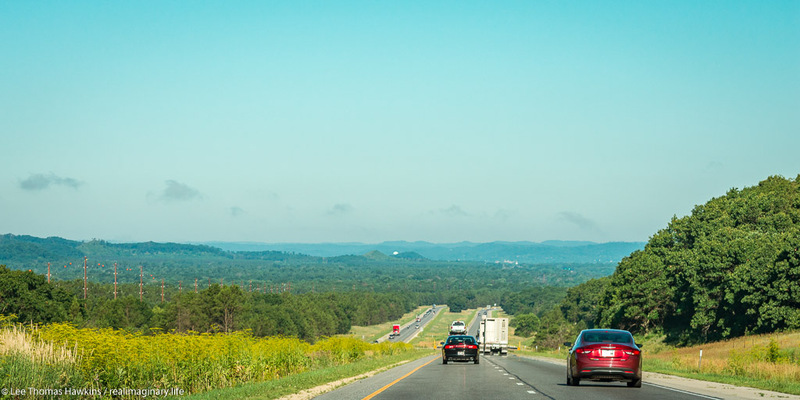 A couple of hours later we entered the state that happens to be the centerpiece of our trip—South Dakota! 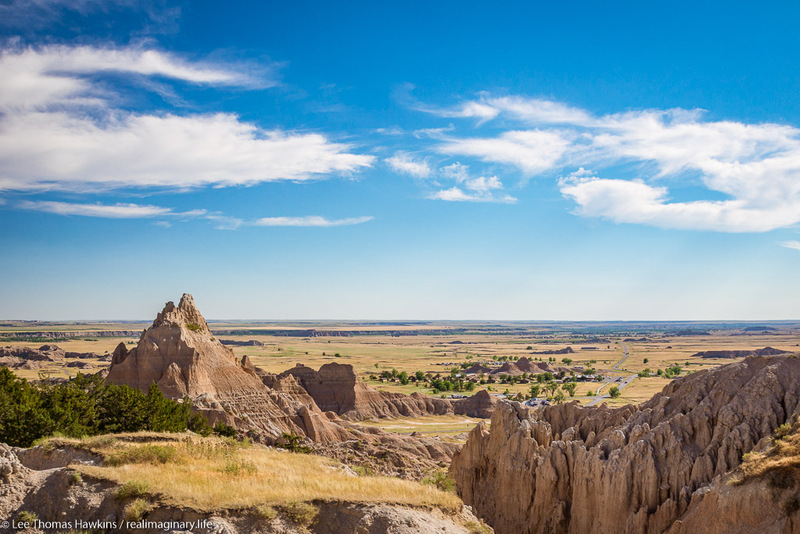 The only bummer is that our destination at Badlands National Park is actually on the western side of the state…so we still had several hours of driving. 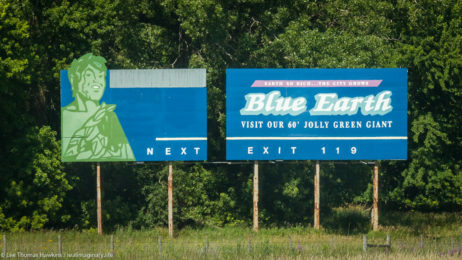 South Dakota is fun though…mainly because of the plethora of eccentric tourist gimmicks along the way! 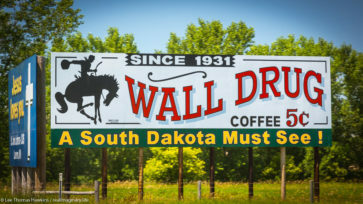 One of the state’s tourist stops, Wall Drug, has dozens of cheesy billboards along I-90 for hundreds of miles—we even spotted one back in Minnesota! I’ll have more on Wall Drug in tomorrow’s post, but first we return to another famous South Dakota tourist attraction—the Corn Palace in Mitchell. After a quick refuel, we pulled up to Corn Palace in Downtown Mitchell at 3:20pm. The 100°F heat and our 10-minute parking space made this a brief stop to check out the building’s exterior look for 2017. We spent more time here in 2015, but the top of the building was still in pieces and the weather was rather dismal. Today the weather is perfect and the building is 100%, so we wanted to see the finished product. 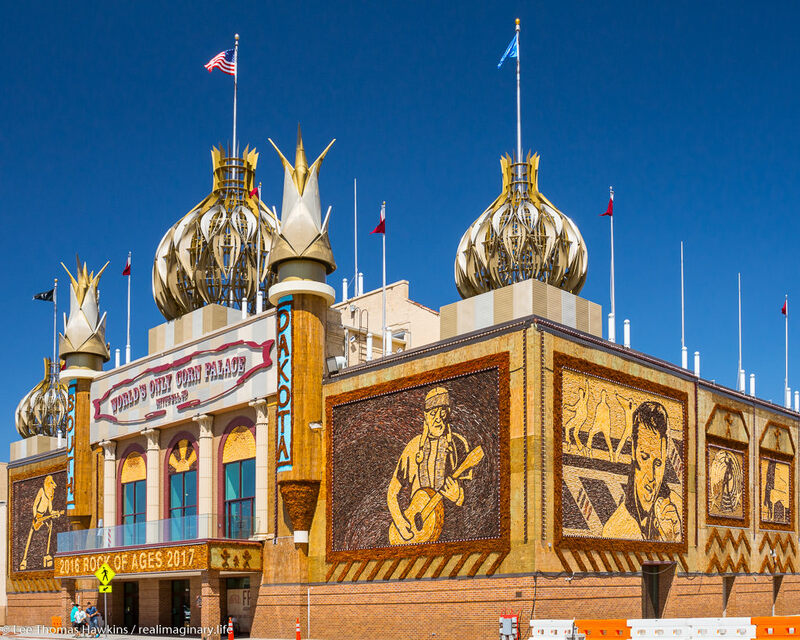 The Corn Palace in Mitchell, South Dakota receives a new exterior look each year—which is always crop art made of local corn and grasses. For 2016-2017, the building has been decorated with the theme, “Rock of Ages”, featuring recording artists such as Willie Nelson and Elvis Presley. After three more hours of driving (and actually being able to see the Missouri River this time), we passed through the center of the state and arrived at the Northeast Entrance Station at Badlands National Park around 5:30pm. As we crossed the state and as we came into the park we could tell by the golden grass that this year was far more dry than when we visited in 2015. We stopped at the Cliff Shelf parking lot along the way to our campsite. Becky checked out the nature trail, while I walked up the road toward Cedar Pass to get a better look at the expansive view to the West. We then drove the short distance to our site at Cedar Pass Campground. Within 30 minutes we had our tent set up and chicken breasts cooking on our handy little camp stove. (I’d hoped for hamburgers, but all of the packages had yet to thaw in spite of the heat!) There are no fire rings or fires allowed in Badlands National Park, so when ALDI had a portable camping stove for a mere $15, we jumped on it. We knew we’d use it on this trip, and it’s quite likely we’ll need it when we travel to the arid Southwest in September. 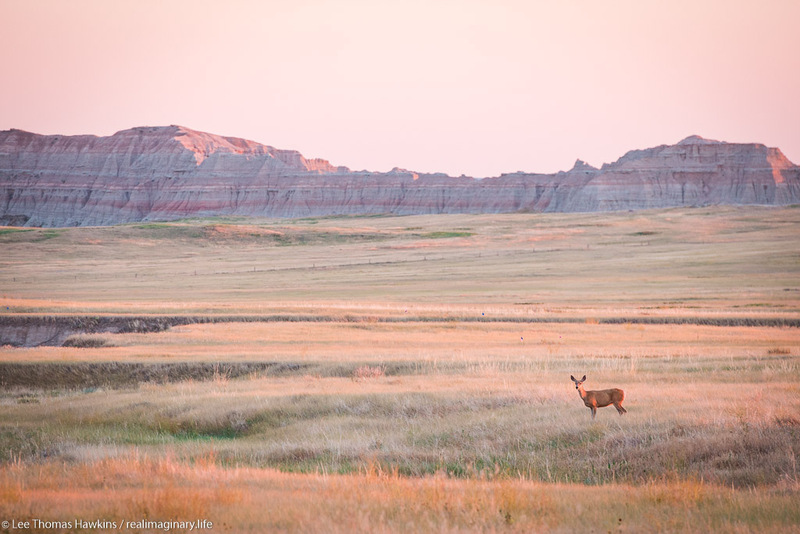 A deer looks up from grazing near the Badlands Loop Road just south of Norbeck Pass in South Dakota’s Badlands National Park. At the White River Valley Overlook, a perfect moonrise was in progress over a peak known as The Castle. I totally forgot about the full moon! It was a brilliant sight, wonderfully timed with the sunset. 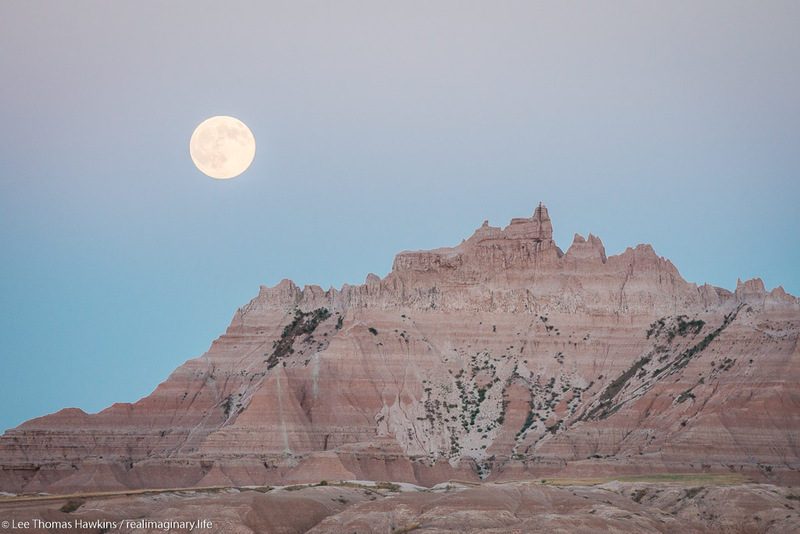 A full moon rises over The Castle at sunset from the White River Valley Overlook in South Dakota’s Badlands National Park. Before it got too much darker, we drove a bit further. We saw several pronghorn antelope grazing along the road near the Homestead Overlook. It was way too dark for any good photos though, so we turned around and headed back to camp. 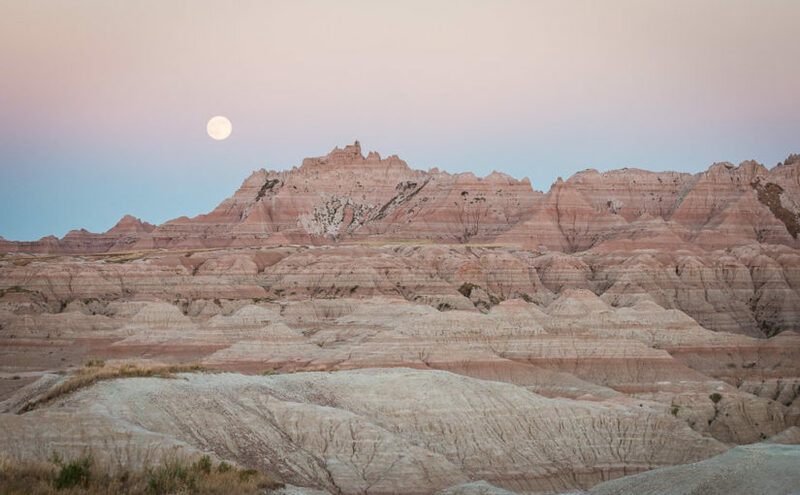 The bright moonlight made the jagged badlands look other-worldly. We got back to camp at 9:35pm. We already had our tent and sleeping pads set up. The only thing left to do was unroll our sleeping bags and jump into bed. While it was rather breezy when the sun was out, a mild breeze had set in for the night. 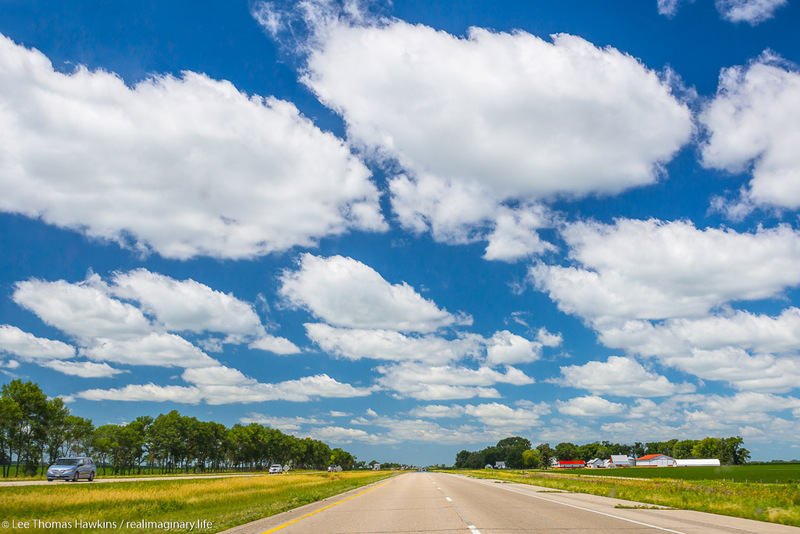 The high temperature today was a warm 95°F and our evening low would be a clear and dry 68°F. As a result we pitched our tent without a rainfly so we wouldn’t get too warm. Thank goodness we got to bed at a reasonable time! Tomorrow’s high would be a blazing inferno of over 100°F—so we’ll need an early start if we want to do any hiking. We changed our clothes and settled into bed at 9:45. Sunrise was at 5:15am MDT and I planned for us to be up and about shortly after that.